AOS has a Document Solution to make your office more productive from managing your print environment, an area many managers believe is out of control, to providing personal paperless document management at the desktop. We have the right solution. Your Print Environment includes print and copy hardware, protocols, toners and consumables, and service with a large difference in per page cost for all these. Many managers and business owners believe their print is out of control and don’t think they have a good understanding of what it really costs. 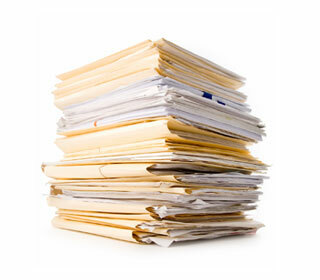 Do you have a back log of paper documents that need to be filed? Are banker boxes taking up too much room or are important documents hard to retrieve? Our Digital Imaging Services can solve these concerns. Reduce your storage space and effectively capture valuable information. Integrate your information into an important workflow/distribution system. If you are still archiving, storing and retrieving paper documents or have years of files stored in boxes or filing cabinets, you should consider the Ricoh Digital Imaging Services to improve your office productivity and free-up storage room. Looking for a personal paperless document management system that allows you to do more with every document? Get faster access to your documents while password protecting your files. Create searchable PDF files for easy retrieval. Convert your paper documents into electronic files for distribution, indexing and archiving. Seamlessly integrates with other devices such as Ricoh MFPs from a desktop or mobile tablet to assemble and manage PDFs and Windows® files in any format with ease. Moving your business to a paperless operation? Do you want to get rid of all that paper cluttering up your desk? Do you have a document disaster recovery plan? Content Central will help you move your company from paper dominated processes to the efficiency of a paperless office. You will enhance your office infrastructure by capturing paper, emails, and other files to a central repository for secure document access when needed. Just by searching in Content Central with a word or two or an account number, you can give your staff fast and secure access to your day-to-day and archived business documents. Want to save time and improve productivity by automatically sending documents to the right person for processing? Psigen makes your documents “smart” so Content Central or other document management solutions know where to put them. Common departments with repetitive workflows such as Accounts Payables, HR, Sales, or Shipping, etc. can all be more productive. Smart Documents are indexed so that other applications recognize what they are and can be routed intelligently to where you want them. Automating the movement of your documents will save you time and make your operation more efficient. Either by itself or in partnership with Content Central, Psigen can make your operation more productive.